Council of Scientific & Industrial Research had declared the result of NET June 2016 exam on 07 October 2016. The test was held successfully on 19 June 2016. 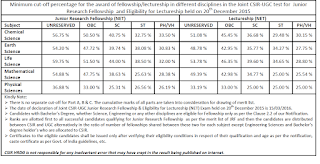 The candidate's eligibility for JRF/ Lecturership is to be determined through this test. Now the results had been released by CSIR official website. Council of Scientific & Industrial Research conducts this exam two times every year. Last time, it had organized National Eligibility Test (NET) on 19 June 2016 at various centres all over the country. Those who qualify this exam will be given eligibility certificate. The Fellowship will be effective from 01-01-2017. Successful candidates are requested to send attested/self-attested photocopies of the following documents for verification and issue of Qualifying Certificate: (i) Xth class certificate as a proof of date of birth (ii) degree/provisional degree of qualifying exam/M.Sc or equivalent degree (iii) final marksheet with the required percentage of marks (iv) caste certificate, if applicable. Now this is to update those applicants who had been waiting for CSIR NET Results declaration. There wait is over now as CSIR had released the result of June 2016 exam now. All those candidates can check the merit list, marks and cut off from below given links. 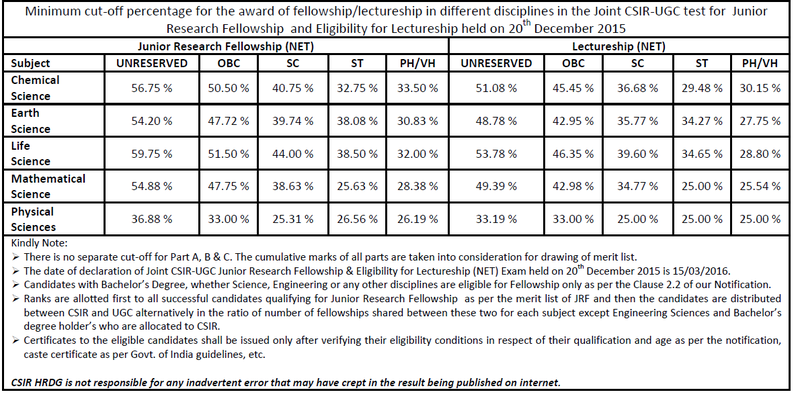 Two separate merit lists had been released, one comprising the candidates qualifying for the award of Junior Research Fellowship (JRF - NET) and the second, of those candidates qualifying the Eligibility Test for Lectureship (NET). These are on the basis of their performance in the test. Candidates qualifying for JRF (NET), will also be eligible for Lectureship (NET) subject to fulfilling the eligibility criteria laid down by UGC. The candidates qualifying for Lectureship will be eligible for recruitment as Lecturers as well as for JRF-ship in a Scheme/Project, if otherwise suitable. CSIR had organized the National Eligibility Test for determining the eligibility of award of Junior Research Fellowships (JRF) NET and for appointment of Lecturers (NET) in certain subject areas falling under the faculty of Science & Technology. The award of Junior Research Fellowship (JRF) will depend on their finding admission/placement in a university/ national laboratory/ institution of higher learning and research, as applicable. The result of the passed out candidates had been displayed on our website www.csirhrdg.res.in and you can check it from below given links. No separate intimation letter will be issued to the successful candidates. To check CSIR NET Cut off of December 2016 exam, check the below given image.